The Writing Vein: Finisher Shirts - for writers! Sparked by a conversation during Bonnie's recent tour stop here, I decided that writers deserve finisher shirts, too. As I told Christi, who first commented on thinking in "finisher mode," runners and walkers of marathons get finisher shirts. Many participants in 10k's get finisher shirts. I haven't yet done a triathlon or biathlon - but I'm sure they get finisher shirts. Writing a novel is at least as hard as running/walking a marathon. And takes just as much preparation. No, I take that back - more preparation. For many of us. And, we're not done when we cross that finish line of the last page. 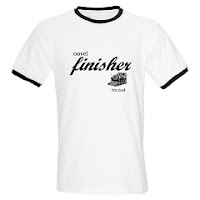 So - today I set up a small shop over at CafePress dedicated to the novel finisher. When I saw some of the other products they had I noticed other things the writer who has finished a novel might need as they head into revisions: like a coffee mug, a mousepad, a wall clock. Have I told you that titles are not my strong point? They're not. So, in a somewhat uncreative moment of non-inspiration, the CafePress shop is called - tada - Writing Vein Novel Finisher. Just click on that obvious title and you can see what's there. To the right is a picture of the Ringer T-shirt to whet your appetite. I love all the 'finisher' merchandise. But I only crossed the 50,000 mark for NaNo, I haven't written "the end" yet. That doesn't make me a finisher does it? Dang, I want one of those mouse pads!